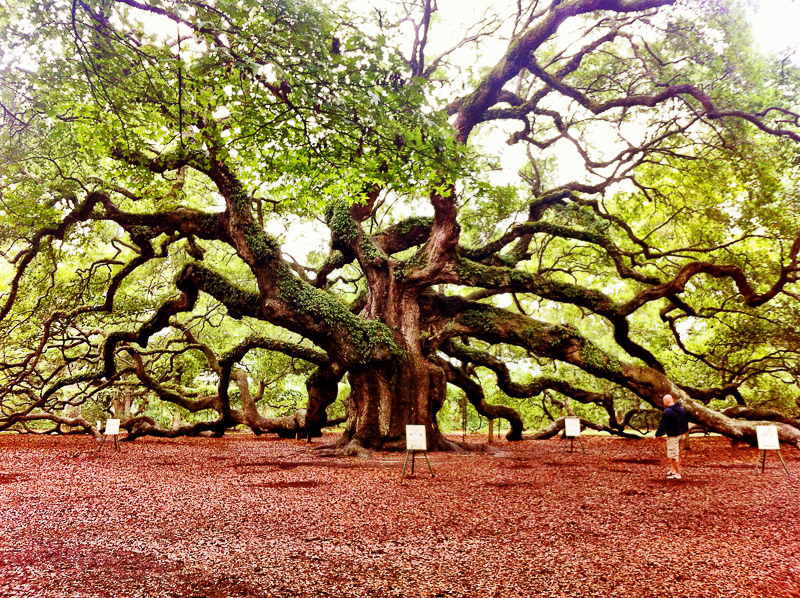 The Angel Oak is said to be the oldest living thing east of the Rocky Mountains. This ancient Live Oak located in Johns Island, South Carolina just twelve miles from Charleston historic district is a hidden gem few visitors know about. Majestic Live Oaks draped in Spanish Moss lining the streets of the deep south are some of the first images we conjure up when thinking of places like Charleston and Savannah. The tree was named “Live” – as in a-live – because it’s evergreen. It’s always in leaf – always alive when other trees go dormant. It’s remarkable to think that the Angel Oak has been green for a thousand years. The Angel Oak was once buried deep in a forest, but today it’s tucked inside a small park owned by the city of Charleston. 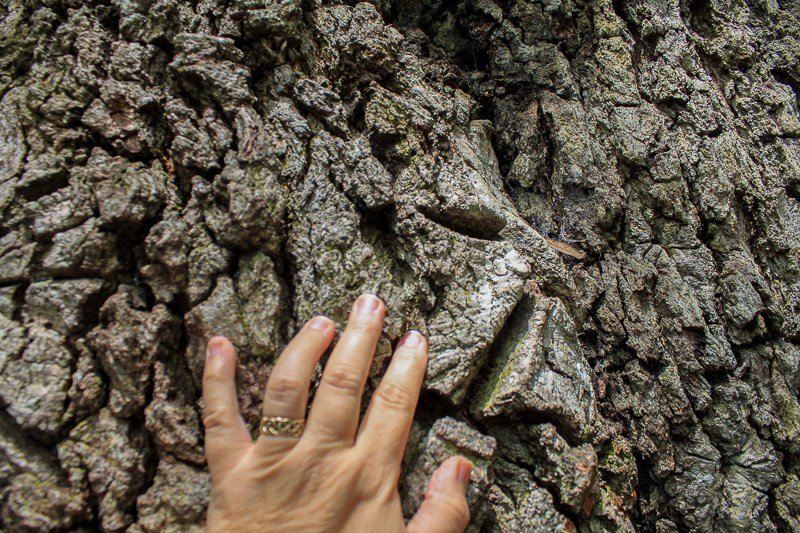 Just to see this creature – and yes I write creature because the tree is alive with energy that gives it an identity, a personality – is an unforgettable experience. It’s hard to take in the massiveness of this tree – which is all at the ground level. People approaching an ancient California redwood naturally turn their eyes upwards, following the lines of tree. With the Angel Oak, the presence of the tree is at body level and almost impossible to take in. One doesn’t walk under the Angel Oak. One walks into it. The branches are so old that many of then (the largest being 11 feet in circumference) extend from the massive trunk and simply lay on the ground. Conservative estimates date the tree at 300 to 500 years old. Others estimations climb as high as 1500 years. The tree stands 65 feet high and 25 feet around the trunk. The spread or canopy of the tree covers 17000 square feet. From tip to tip, the tree reaches 187 feet across. The largest branch is 89 feet long. The name Angel was given to the tree not because of its mystical quality or power, but because the land on which it sits was last owned by Martha and Justin Angel. Though there’s been confusion about the name’s origination because the tree has long been tied to stories of apparitions, of “faces” appearing in among the branches. … faces of African slaves who were laid to rest nearby or who have stories to tell the visitor. There is definitely an old energy about the tree. A healing energy. It’s interesting to stand and watch other visitors approach the tree. On my visit I noticed that each visitor paused before entering. Then, as I walked “into” the tree there were others there with me. Everyone was quiet. People whispered to each other rather than talking in a normal tone of voice. 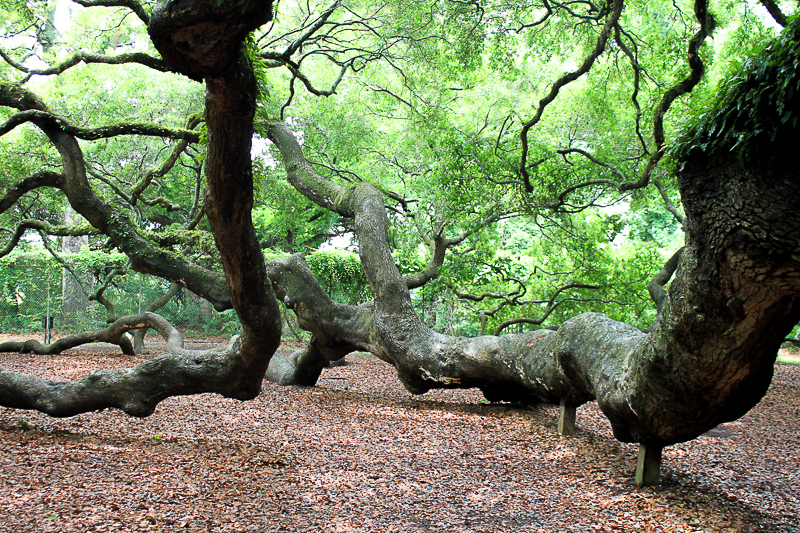 It’s no wonder people come to the Angel Oak to reflect and to feel the peace that falls about the place. I can’t wait to go back. 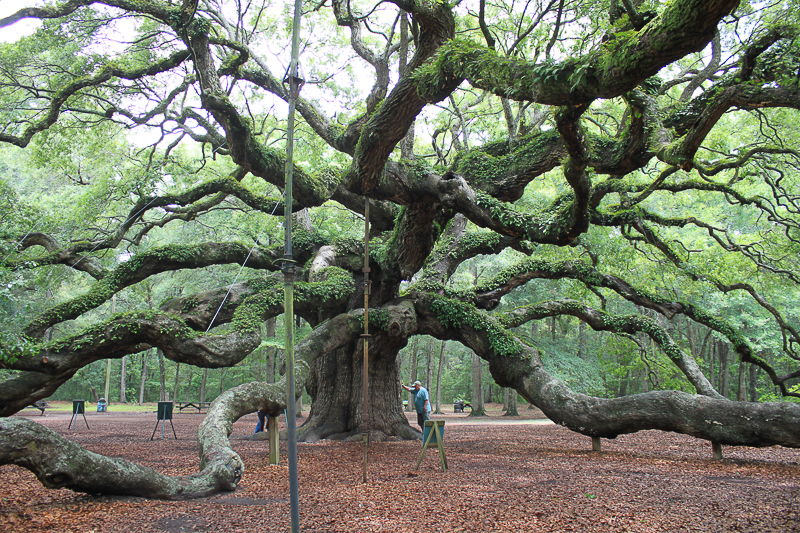 Angel Oak is located near the intersection of the Maybank Hwy and the Bohicket Road / Main road on Johns Island, SC. There are so many good books on sacred trees.